Welcome back to the Thursday ramblings. This week is around the mid-point of the season so I decided to go back over my top ranked prospects from the Prospect Report, some top ranked prospects from The Athletic, Dallas underutilizing their young depth, and my top 10 2018 prospects right meow. Corey Pronman released his “2017-18 midseason Top 50 NHL prospects” over at the Athletic and considering he is a big time follow on twitter and read (if you want to get past the pay wall, I did it is worth it) if you want additional prospect information. I will of course not produce his whole list as I do not want to get anyone in trouble, but his top five are pretty interesting. I do not find Pronman to be one who increases the statuses dramatically of prospects who are World Junior tournament standouts, but a good tournament always looks good on players. Mittelstadt, Tolvanen, and Necas are three you will likely find on a majority of scouts top five lists. Heiskanen was just tearing up the Finnish Elite League but is currently out with an upper body injury. The more surprising name is Henrik Borgstrom at number five who many people may not have that high, but with Pronman rating him at #5 I may bump him up my personal rankings and try to add him in keepers as he will be cheaper than anyone else in this top five. If you do not know who Borgstrom is, he is routinely on highlight reels for the NCAA and could possibly step into the NHL at the end of this season or full-time for 2018-2019. When making our own top 50’s here at Dobber Prospects we have to include players who have zero NHL regular season games, so I will give my own updated top five (not including 2018 draftees) after going over my top 10. Vladislav Shipachov – Well I would say I want a mulligan here but honestly this is more on Vegas mismanagement than anything. Yes I know it looks like Vegas does not need him right now but why sign him in the first place then. I digress. Sam Steel – Still a big fan, was concerned with his early season struggles but he has righted the ship in a big way. Michael McLeod – Not utilized by Team Canada at all in the World Juniors, I am also a Devils homer, but yeah he has been surpassed by other players. Elias Pettersson – Everyone favorite Dobber Writer Cam Robinson (@crazyjoedavola3) will be proud of me having Pettersson on my initial list, and EP currently looks out of this world in the SHL. Kirill Kaprizov – I told you he is not moving. If he was in the NHL right now I believe he would be right up there with Mathew Barzal and Brock Boeser for the Calder. Whichever year he comes over he will be a good value bet on a Calder trophy win. Nick Suzuki – I am also a big Suzuki fan and think a lot of teams will regret letting him drop to #13. Honorable mentions: Necas, Gusev, Pettersson, Steel, and Abramov (yes there are likely people I am forgetting because that always happens. Personally I rate defensemen lower than most as I find young defensemen take longer to develop and have a harder opportunity to get into a spot to succeed. Ken Hitchcock was talking about the Dallas Stars’ need for depth scoring as this team really relies on their big three and John Klingberg, but I feel part of that is self-inflicted. Hitch is a coach who is notorious for not giving rookies (or scoring players in playoff games) ice time to really benefit from. Remi Elie, the 2013 second round selection, has nine points in 38 games but is only averaging 10:27 per game and there is skill there if given an opportunity. Elie never really dominated the AHL in a way you hope top prospects can, as he probably required an extra season in the AHL and a decent Texas Stars team. Gemel Smith does look to be more of a bottom six forward, but in 29 games he is only averaging 9:42 per game with nine points in those games. 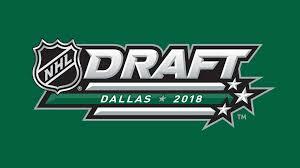 Smith was a 2012 fourth round selection so the fact that he made it this far is pretty impressive, but would a few more minutes a game hurt the Stars. Brett Ritchie is the biggest mismanaged player on the Stars roster this season (watch for a potential break out when Hitch is gone). After scoring 16 goals last season Ritchie has four in 37 games, and his ice time has been reduced from 12:54 to 10:45 per game. That is not a recipe for success. Perhaps a reason for the depth scoring disappearing is Spezza falling off a cliff production-wise this season, but I would largely link the problems to a lack of opportunity for younger players to grow in the roster. Rasmus Dahlin – I had Svechnikov here until December. Dahlin is insane on the ice, #1 all the way. Andrei Svechnikov – Getting little opportunity to succeed on Team Russia Svechnikov is still a beast in the OHL. 81 shots in 21 games, incredible. Filip Zadina – I was already a big fan. He doesn’t have the power to take over a game like Svechnikov but he has the skill to put up major points. Quinn Hughes – Something about this kid just screams top talent to me, I fear he will drop in the draft because #Size but don’t let him fall too far in your prospect draft. Adam Boqvist – Another top offensive defenseman, I have just watched Hughes more than I have with Boqvist. I hope you enjoyed my massive amounts of writing.